The oldest remaining record in international shooting sports was the 581 score in 50m Free Pistol set way back in 1980 at the Moscow Olympics. After thirty-four long years, that record has finally been broken — by South Korea’s Jin Jong-oh. The South Korean, who earned gold medals in both the 2008 and 2012 Olympic Games, has been chasing this record for a long time, and now it is his. Congratulations to Jin Jong-oh. Well done! South Korean pistol ace Jin Jong-oh scored a combined 583 points on the way to winning the 50m Free pistol title in Granada on Tuesday. With his 583 score, Jin broke (by two points) the world record set by Russian Alexander Melentiev at the 1980 Olympics. This was the first individual world title for Jin, who won 50m pistol gold at the 2008 and 2012 Olympics and also added the 10m title at the London Games. Records are “meant to be broken” they say. This was a long time coming. But Jin Jong-oh, the five-time Olympic medalist from South Korea, finally broke “The Record” — that historical 581-point world record set in 1980 by Alexander Melentiev of the USSR. Melentiev’s 50m mark was the longest-lasting shooting world record. Athletes from all over the world had been chasing that record for 34 years. Smallbore rifle events begin Wednesday with the Elimination Matches in Men’s Prone. Ready to compete is three-time Olympic medalist Matt Emmons, 2012 Olympian Michael McPhail, and Air Force Academy cadet David Higgins. A two-time Olympic medalist and three-time World Champion medalist in the event, Emmons arrived in Granada minus his two smallbore rifles courtesy of the Paris Charles De Gaulle airport, which seems to have lost or delayed many guns bound for the World Championships in Spain. Thankfully, Emmons has McPhail’s three-position gun available for the elimination. Emmons is familiar with that type of rifle so, hopefully, this will not be too great a set-back for Matt. Want more info? CLICK HERE for ISSF World Championships results and schedules. Share the post "South Korean Breaks Oldest Record in ISSF Shooting"
We could say “It’s about time”… but let’s just praise the NSSF for taking this important step. We need more strong voices in Washington arguing on behalf of gun owners, and promoting the interests of those who craft, sell, and maintain accurate firearms. On September 10, the National Shooting Sports Foundation (NSSF), the trade association for the firearms industry, opened its new office in The Hall of the States Building on Capitol Hill. 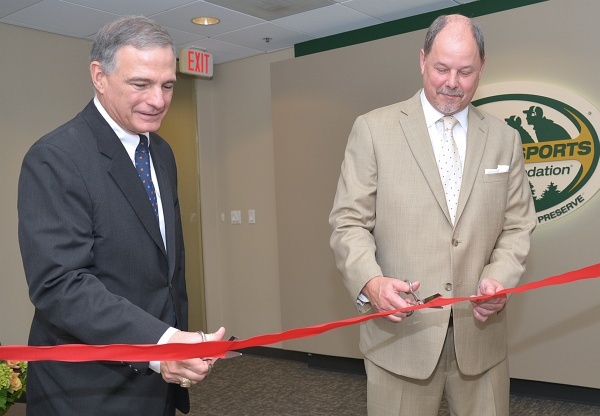 NSSF President Steve Sanetti, left, and Jeff Reh, NSSF Board of Governors Co-Vice Chairman and Beretta USA General Counsel, officially open NSSF’s new Washington, D.C., office. Formed in 1961, NSSF has a membership of more than 10,000 manufacturers, distributors, retailers, shooting ranges, sportsmen’s clubs and publishers. For more info, visit nssf.org. Share the post "NSSF Opens Washington, D.C. Office"